Working with 6a Architects as part of their six month residency at The Institute of Contemporary Arts inside the Nash terrace on The Mall in central London, an under-utilised workshop space has been re-appropriated & given a new life as a studio space for public events & an archive area for use by members & researchers. The old equipment, tool cabinets & empty crates have been relocated elsewhere within the premises, & a series of low key interventions have been introduced amongst workshop remnants such as an old paintbrush cleaning sink, hot water cylinder, active goods lift, & miles of conduits & cabling. 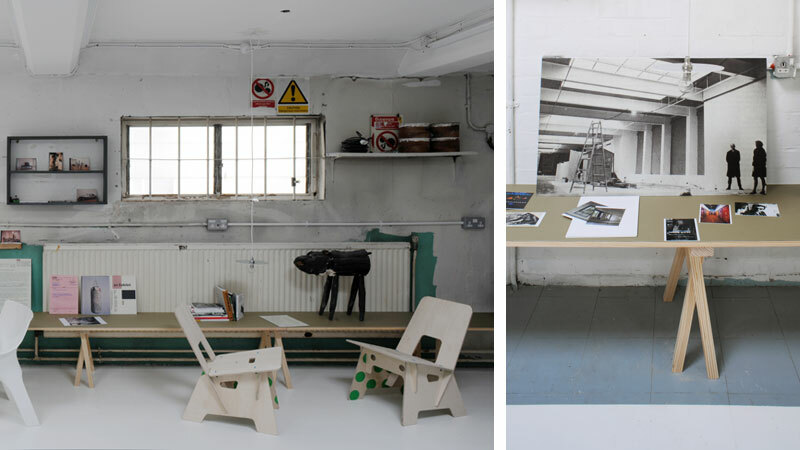 The new uses of the room are faciltated by a collection of furniture & fittings overlaid onto the old paint splattered tiled floor, against the painted brickwork walls covered with health & safety signs, & years of jottings & doodles by workshop technicians. Working to a very limited budget, new installations including a workbench & archive box storage shelving have been expediently designed & built on site using found materials such as reclaimed timber studwork from past exhibitions & old metal shelving angles. Salvaged plan chests & filing cabinets have been adapted, redecorated & made mobile by the addition of casters. To allow for a variety of events & functions with different sized groups to take place, loose furniture which is reconfigurable & easy to store was proposed. Pieces designed previously including Wooden trestle two with linoleum faced table tops, Folding timber bench & Slatted timber shelves sit alongside the purpose made items. A reduced height version of the wooden trestle was appropriated to support the perimeter display shelf. With special thanks to Jack Neville for his assistance. Photography by David Grandorge courtesy of 6a Architects.